Q.1 Can sound travel through- (a) iron (b) water ? Q.2 Can sound travel through vacuum ? Q.3 Name the type of waves which are used by astronauts to communicate with one another on moon (or in outer space). Sol. Electromagnetic waves (Radio waves). Q.4 Name one solid, one liquid and one gas through which sound can travel. Sol. Solid - iron, liquid - water, gas - oxygen. Q.5 Which of the following cannot transmit sound ? Q.6 Name the physical quantity whose SI unit is 'Hertz'. Q.7 What is the SI unit of frequency ? (a) by density-distance graph ? (b) by displacement-distance graph ? Q.9 Is the speed of sound more in water or in steel ? Q.10 In which medium sound travels faster : air or iron ? Q.11 In which medium sound travels fastest : air, water or steel ? (a) in which medium sound travels slowest ? (b) in which medium sound travels fastest ? Q.13 Which of the following is the speed of sound in copper and which in aluminium ? Sol. Copper - 3750 m/s ; Aluminum - 5100 m/s. Q.14 If you want to hear a train approaching from far away, why is it more convenient to put the ear to the track ? Sol. Since sound travel much faster in solids, It will be heard much sooner through a track than through air. (c) In iron - 5950 m/s. Q.16 What name is given to those aircrafts which fly at speeds greater than the speed of sound? Q.17 A jet aircraft flies at a speed of 410 m/s. What is this speed known as ? Q.18 What is meant by supersonic speed ? Sol. When the speed of an object is greater than the speed of sound, it is called supersonic speed. Q.19 State one observation from everyday life which shows that sound travels much more slow than light. Sol. Thunderstorm is heard after lightning is seen. Q.20 Name the two types of waves which can be generated in a long flexible spring (or slinky). Sol. Longitudinal and transverse waves can be produced. Q.21 A stone is dropped on the surface of water in a pond. Name the type of waves produced. Q.22 Name the type of waves produced when a tuning fork is struck in air. (a) compressions and rarefactions ? (b) crests and troughs ? (i) in the same direction as wave. (ii) at right angles to the direction of wave. Q.25 What type of waves are illustrated by the movement of a rope whose one end is fixed to a pole and the other end is moved up and down ? Q.26 What should an object do to produce sound ? Q.27 What is the name of the strings which vibrate in our voice box when we talk ? Q.28 Name the device which is used to produce sound in laboratory experiments. Q.29 What is the nature of sound waves in air ? Q.30 What conclusion can be obtained from the observation that when the prongs of a sound making tuning fork touch the surface of water in a beaker, the water gets splashed? Sol. That the prongs of tuning fork are vibrating. Sound produced by a vibrating body travels to our ears by the actual movement of air. Q.32 Which of the following travels slowest in air and which one fastest ? Sol. Slowest - Sound and Fastest - Light. Q.33 Which term is used to denote a speed greater than the speed of sound ? Q.34 In which medium sound travels faster : air or hydrogen ? Q.35 A tuning fork has a number 256 marked on it. What does this number signify ? Sol. Frequency of the tuning fork . Q.36 What is the time-period of a tuning fork whose frequency is 200 Hz ? Q.37 Calculate the frequency of a wave whose time-period is 0.02 s.
Q.38 What will be the change in the wavelength of a sound wave in air if its frequency is doubled ? Q.39 If 20 waves are produced per second, what is the frequency in Hertz ? (e) The speed of sound in a solid is................... than the speed of sound in air. Q.41 What is vacuum ? Explain why, sound cannot travel through vacuum ? Sol. Region where there are no particles of matter is called vacuum. Sound cannot travel through vacuum because it needs a medium to travel. Q.42 Explain the term 'amplitude' of a wave. Draw the diagram of a wave and mark its amplitude on it. Sol. The maximum displacement of a particle from its mean position is called amplitude. In below figure A is amplitude. Q.43 (a) Distinguish between longitudinal and transverse waves. (b) Are sound waves longitudinal or transverse ? 2. It travels in the form of crests and troughs. 3. Light waves are transverse waves and may travel in vacuum. 1. The particles vibrate about their mean position in a direction parallel to the direction of propagation. 2. It travels in the form of compression and rarefaction. 3. Sound waves are longitudinal waves and can be produced only in a material medium. (b) Sound waves are longitudinal. Q.44 A cricket ball is seen to hit the bat first and the sound of hitting is heard a little later. Why? Sol. Since light travels much faster than sound, we see the ball hit the bat and hear the sound later on. Q.45 Explain why, the flash of lightning reaches us first and the sound of thunder is heard a little later. Sol. Since light travels at a very great speed as compared to the speed of sound, we see the flash before the sound. Q.46 Explain why, the flash of a gun shot reaches us before the sound of the gun shot. Q.47 Which of the following terms apply to sound waves in air and which to water waves? Water wave - transverse, trough, crest. Q.48 (a) Name four ways in which sound can be produced. (b) Calculate the speed of a sound wave whose frequency is 2 kHz and wavelength 65 cm. Sol. (a) Sound can be produced by vibration of vocal chords, blowing air in the flute, striking a drum , explosion. V = = 2000 × 0.65 = 1300 m/s. Q.49 If a ringing bicycle bell is held tightly by hand, it stops producing sound. Why ? Sol. Sound is produced due to vibration in the bell. When the bell is held tightly in the hand, the vibrations stop. Hence sound stops. Q.50 Which object is vibrating when the following sounds are produced ? (v) The air column inside the flute. In most of the cases, we cannot see the vibrations of a sound producing object with our eyes. Sol. The lowest frequency that we can hear is 20 Hz. The time period of this vibration will be s or 0.05s. Due to persistence of vision in our eyes we cannot see vibration of less than 0.1 s.Therefore we cannot see the vibrations of any sound producing object. 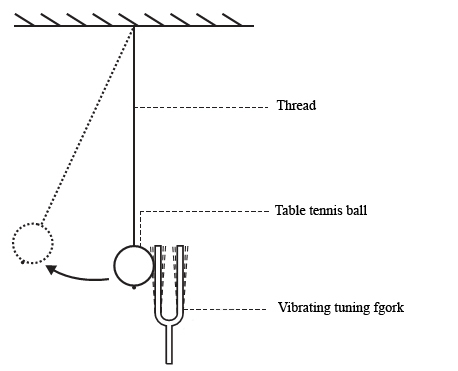 Q.52 Describe a simple experiment to show that the prongs of a sound producing tuning fork are vibrating. Sol. 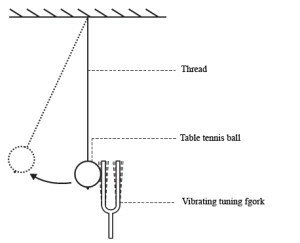 Suspend a tennis ball on a rigid support by means of a string. Touch the vibrating tuning fork. You will are that the tennis ball is set into motion by the vibration. Q.53 When we open a gas tap for a few seconds, the sound of escaping gas is heard first but the smell of gas comes later Why ? Sol. The speed with which the gas moves is much lower than the speed of sound. So we can hear the sound of escaping gas much before we smell it. Q.54 A sound signal of 128 vibrations per second has a wavelength of 2.7 m. Calculate the speed with which wave travels. Q.55 A wave is moving in air with a velocity of 340 m/s. Calculate the wavelength if its frequency is 512 vibrations/sec ? Q.56 Define the 'frequency' and 'time-period' of a wave. What is the relation between the two? Sol. Frequency is the number of vibration produced in one second ( ). Q.57 Explain why, a ringing bell suspended in a vacuum chamber cannot be heard outside. Sol. As sound is a mechanical wave it cannot travel in vacuum. So the bell ringing inside a vacuum chamber cannot be heard. Q.58 The frequency of the sound emitted by the loudspeaker is 1020 Hz. Calculate the wavelength of the sound wave in air in cm where its velocity is 340 m/s. Q.59 What is the difference between a compression and a rarefaction in a sound wave ? Illustrate your answer with a sketch. Sol. Compression : Particles of the medium are pushed close to each other. It is a region of high density and pressure. Rarefaction : Particles of the medium move away. It is a region of low density and pressure. Q.60 (a) What is sound ? What type of waves are sound waves in air ? (b) Describe an experiment to show that sound cannot pass through vacuum. (a) Sound is a form of energy which gives the sensation of hearing waves. Sound waves are longitudinal waves. (b) Take an electric bell and an airtight glass bell jar. The electric bell is suspended inside the airtight bell jar. 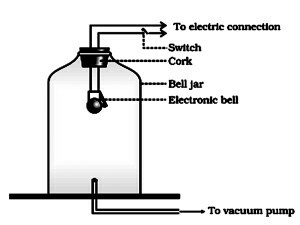 The bell jar is connected to a vacuum pump,as shown in Fig. If you press the switch, you will be able to hear the bell. Now start the vacuum pump. When the air in the jar is pumped out gradually, the sound becomes fainter, although the same current is passing through the bell. After some time when less air is left inside the bell jar you will hear a very feeble sound. When all air is removed no sound is heard. This shows that sound can not pass through vacuum. Q.61 (a) How is sound produced ? Explain with the help of an example. (b) How does sound from a sound producing body travel through air to reach our ears ? Illustrate your answer with the help of a labelled diagram. 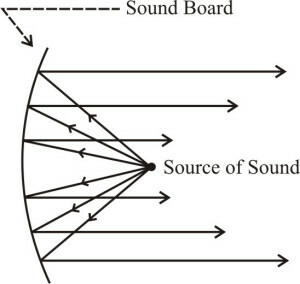 (a) Sound is produced by the vibrations of any object. These vibrations are transferred to air particles and reach to us. For example - In school bell, when the gong strikes the bell, vibrations are produced in the bell which are transmitted through the air to our ears. These vibration produce sensation of sound in our ears. (b) When a body vibrates the air in its neighbourhood is alternately compressed and rarefied. The compressed air has higher pressure than surrounding air. It therefore pushes the air particles near it causing compression to move forward. A rarefaction or low pressure is created at the original place. These compressions and rarefaction cause particles in the air to vibrate about their mean position. The energy is carried forward in these vibration. This is how sound travels. 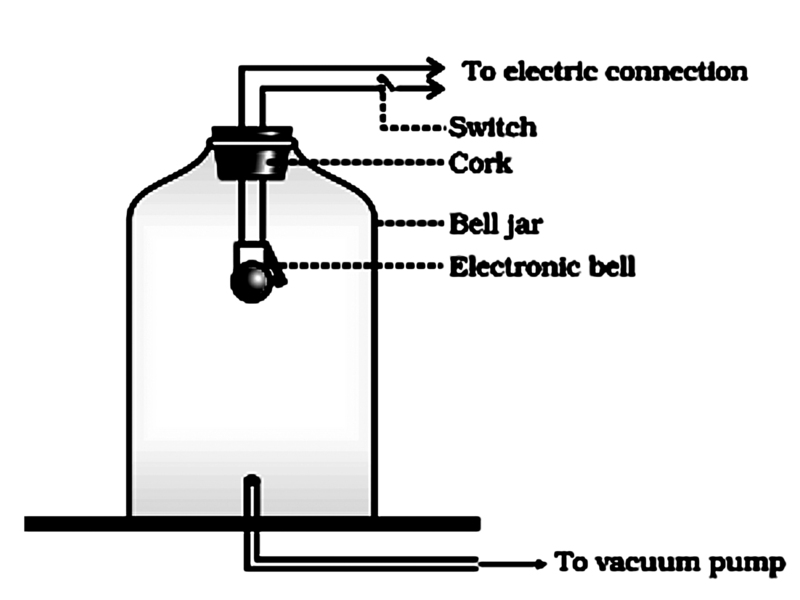 Q.62 (a) An electric bell is suspended by thin wires in a glass vessel and set ringing. 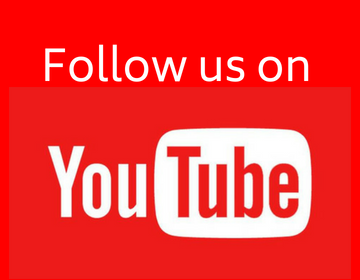 Describe and explain what happens if the air is gradually pumped out of the glass vessel. (b) Why cannot a sound be heard on the moon ? How do astronauts talk to one another on the surface of moon ? (a) As the air inside the vacuum tube is pumped out, it becomes fainter. When all air is pumped out , no sound is heard. This is because air requires a material medium to travel. (b) There is no atmosphere in the moon, so sound cannot propagate. Astronauts talk through radio wave. 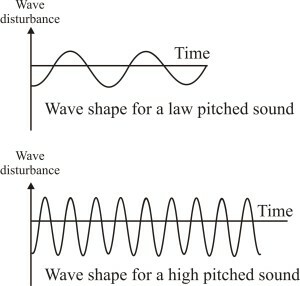 Q.63 (a) Define the terms 'frequency','wavelength' and 'velocity' of a sound wave. What is the relation between them ? (b) A body vibrating with a time-period of produces a sound wave which travels in air with a velocity of 350 m/s. Calculate the wavelength. 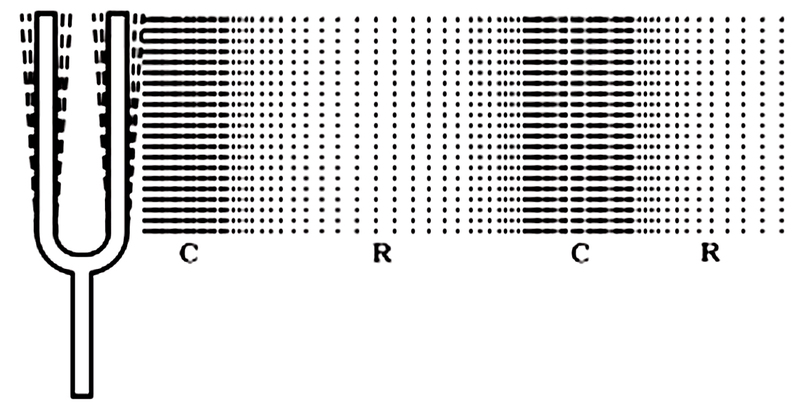 (a) Frequency : One compression and one rarefaction constitutes one vibration. The number of vibration in a second is called frequency. Its unit is Hertz. 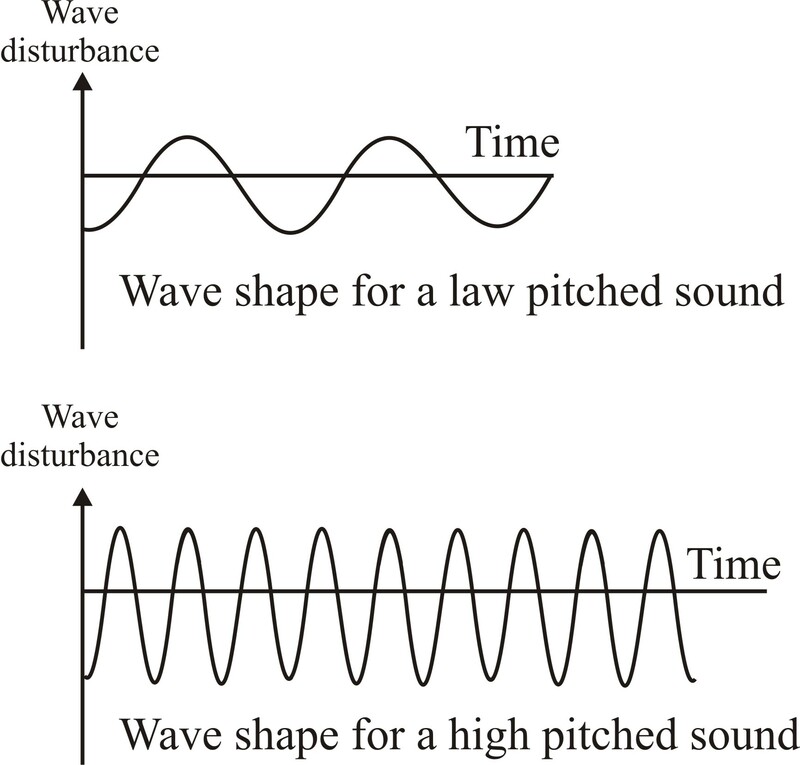 Wavelength : The distances between two consecutive compressions or rarefaction of a wave. Its S.I unit is meter. , therefore λ = v x t = = 1.37 m.
Q.64 (a) What are longitudinal waves and transverse waves ? Explain with the help of labelled diagrams. (b) Give two examples each of longitudinal waves and transverse waves. (b) Longitudinal wave : Sound waves, Compression of spring causes longitudinal waves. Transverse wave : Light, waves on the surface of water. Q.65 (a) Explain the terms 'compressions' and 'rarefactions' of a wave. What type of waves consist of compressions and rarefactions ? (b) A worker lives at a distance of 1.32 km from the factory. If the speed of sound in air be 330 m/s, how much time will the sound of factory siren take to reach the worker ? (a) Compression : Particles of the medium are pushed close to each other. It is a region of high density and pressure. Longitudinal waves consist of compressions and rarefaction. Q.66 (a) Explain the terms 'crests' and 'troughs' of a wave ? What type of waves consist of crests and troughs? (b) The flash of a gun is seen by a man 3 seconds before the sound is heard. Calculate the distance of the gun from the man. (Speed of sound in air is 332 m/s). (a) When a wave propagates , the particles of the medium vibrate perpendicular to the direction of the wave. The maximum displacement of particle on one side of the wave (+ve side) is called crest and on the other is called trough. Crests and troughs occurs in transverse waves. Q.67 (a) When we put our ear to a railway line, we can hear the sound of an approaching train even when the train is far off but its sound cannot be heard through the air. Why ? (b) How could you convince a small child that when you speak, it is not necessary for air to travel from your mouth to the ear of a listener ? (a) Since sound travels faster in solids, we can hear the sound of train by putting our ear on the solid and only later we can hear though air. (b) Take a slinky end tie one end to the wall and give the other end a push or pull alternately. Compressions and rarefactions move towards the wall i.e. wave moves but the parts of the slinky just vibrates about its mean position. In the same way compressions and rarefactions are produced in air and no net movement of air particles is required for sound to travel. Q.68 Which of the following statement best describes frequency ? Q.69 Which of the following vibrates when a musical note is produced by the cymbals in an orchestra ? Q.72 Which one of the following does not consist of transverse waves? Q.77 The speeds of sound in four different media are given below. Which of the following is the most likely speed in m/s with which the two under water whales in a sea talk to each other when separated by a large distance ? Q.79 The velocities of sound waves in four media P, Q, R and S are 18,000 km/h, 900 km/h, 0 km/h, andd 1200 km/h respectively. Which medium could be a liquid substance ? Q.80 Which of the following can produce longitudinal waves as well as transverse waves under different conditions? Q.81 Draw the sketches of two waves A and B such that wave A has twice the wavelength and half the amplitude of wave B. (a) what is their wavelength ? (b) what is their frequency ? (c) what is their speed ? Q.83 Through which of the following materials can sound travel ? Wood, air, water, steam, ice, hydrogen, steel, diamond. (a) having no fixed shape and no fixed volume ? (b) having a fixed volume but no fixed shape ? (c) having the same composition as that on the moon ? (d) having a fixed shape and a fixed volume ? Q.1 Which property of sound leads of the formation of echoes ? Q.2 What name is given to the repetition of sound caused by the reflection of sound waves ? Q.3 What name is given to the persistence of sound in a big hall or auditorium ? Q.4 Name three devices which work on the reflection of sound. Sol. Loud hailers, stethoscopes, and sounding boards. Q.5 What is the other name of a loud-hailer ? Q.6 Name the three characteristics of sound. Q.7 Name the unit used to measure the loudness of sound. Also write its symbol. Sol. Decibels , its symbol is dB. Q.8 Name the characteristic which helps us distinguish between a man's voice and a woman's voice, even without seeing them. Q.9 How does the pitch of a sound depend on frequency ? Sol. Higher the frequency , higher will be the pitch. Q.10 Name the characteristic of sound which depends on (a) amplitude (b) frequency, and (c) waveform. Sol. (a) Loudness (b) pitch (c) quality. Q.11 Name the characteristic of sound which can distinguish between the 'notes' (musical sounds) played on a flute and a sitar (both the notes having the same pitch and loudness). Q.12 Name the organs of hearing in our body. Q.13 Name that part of ear which vibrates when outside sound falls on it. Q.14 Name the three tiny bones present in the middle part of ear. Sol. Hammer , anvil , stirrups. (a) Which of these bones is in touch with ear-drum ? (b) Which of these bones is in touch with oval window ? Q.16 What is the function of three tiny bones in the ear ? Sol. To amplify the vibrations of sound. Q.17 Name the tube which connects the middle ear to throat. Q.18 Name the nerve which carries electrical impulses from the cochlea of ear to the brain. Q.19 What is the name of passage in outer ear which carries sound waves to the ear-drum? Q.20 Why should we not put a pin or pencil in our ears ? Sol. It may damage the ear drum. Q.21 What type of scans are used these days to monitor the growth of developing baby in the uterus of the mother ? Q.22 How is an ultrasound scan for fetus (unborn baby) better than X-ray ? Sol. X-rays can damage the body cells of an unborn baby. Q.23 What is the name of the device which is used to find the depth of sea (or ocean) by using ultrasonic sound waves ? Q.24 Write the full name of 'SONAR'. Sol. Sound , Navigation and Ranging. Q.25 Name the principle on which a soundboard works. Q.26 Name the device which is used to address a small gathering of people. Q.27 Name the device used by doctors to listen to our heartbeats. Q.28 What is the shape of a soundboard kept behind the speaker on the stage of a big hall ? Q.29 Name two sound absorbing materials (or objects) which can make our big room less echoey. Q.30 Can we hear (a) infrasonic waves (b) ultrasonic waves ? Q.31 What name is given to the sound waves of frequency too low for humans to hear ? Q.32 What name is given to the sound waves of frequency too high for humans to hear ? Q.33 What type of sound waves are produced by a vibrating simple pendulum ? Q.34 What happens to the pitch of a sound if its frequency increases ? Q.35 What happens to the loudness of a sound if its amplitude decreases ? Q.36 What name is given to sound waves of frequencies higher than 20 kHz ? (a) An echo is simply a.......sound. (e) Echoes are caused by the........of sound. Q.38 On which day, a hot day or a cold day, an echo is heard sooner ? Give reason for your answer. Sol. On a hot day, echo is heard sooner since velocity of sound increases with temperature. Q.39 In which medium, air or water, an echo is heard much sooner ? Why ? Sol. In water , since speed of sound is greater in liquids. Q.40 What is reverberation ? What will happen if the reverberation time in a big hall is too long? Sol. The multiple reflection of sound from the walls of a room or hall causing sound to persist for some time is called reverberation. If the hall is too long , the reflection will become an echo. Q.41 How can reverberations in a big hall or auditorium be reduced ? Sol. Reverberation can be reduced by covering the walls and ceiling with sound absorbent materials like curtains and false ceilings. Q.42 Why do we hear more clearly in a room with curtains than in a room without curtains ? Sol. There is less reverberation in rooms with curtains so we can hear sound more clearly as the sound is absorbed by the curtains. 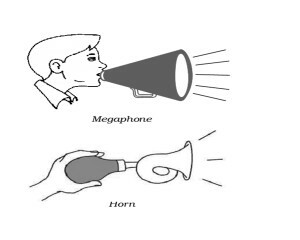 Q.43 What is a megaphone ? Name the principle on which a megaphone works. Sol. Megaphone is a device to direct sound waves in one direction so that the intensity of sound in that direction increases. It s based on the principle of reflection of sound. Q.44 What is a bulb horn ? Name the principle on which a bulb horn works. Sol. A bulb horn is a tube followed by a conical opening. As the bulb is pressed the waves of air come out through the opening and creates sound. It is based on the principle of multiple reflection of sound. Q.45 What is a stethoscope ? Name the principle on which a stethoscope works. Sol. Stethoscope is a medical instrument used for listening to sounds produced within the body, chiefly in the heart or lungs. Principle - multiple reflection of sound. Q.46 What is a soundboard ? Explain the working of a soundboard with the help of a labelled diagram. Sol. 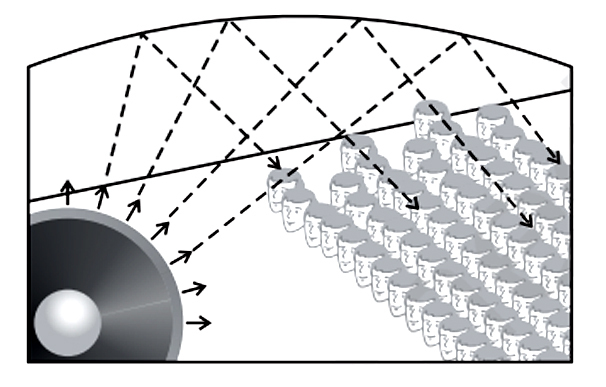 In an auditorium or cinema halls the wall behind the speaker's platform is curved in such a way that sound after reflection moves parallel in the direction of the audience. Due to which the loudness of sound is increased. Q.47 (a) What is meant by the 'loudness' of sound ? On what factor does the loudness of a sound depend ? (ii) loud sound, of the same frequency. Sol. (a) Loudness is the physiological response of our ears to sound. It depends on amplitude and frequency and also age of the person. Human beings can hear sound of frequency between 20 Hz to 20,000 Hz. Q.48 (a) Explain the term 'pitch' of a sound. On what factor does the 'pitch' of a sound depend? (ii) high pitch, of the same loudness. Sol. (a) Pitch is that characteristic of sound that determines the shrillness of sound. It depends on frequency of sound. Q.49 What is meant by the quality (or timbre) of sound ? On what factor does the quality (or timbre) of a sound depend? Sol. The quality or timbre of sound is that characteristic which enables us to distinguish one sound from another having the same pitch and loudness. The sound which is more pleasant is said to be of a rich quality. Q.50 Explain why, if we strike a table lightly, we hear a soft sound but if we hit the table hard, a loud sound is heard. Sol. If we strike a table lightly the vibrations produced have less amplitude than when we strike the table hard. Since loudness depends on amplitude, soft sound is heard when we strike lightly. Q.51 Give one use of ultrasound in industry and one in hospitals? (1) To clean parts of machines hard to reach. (2) Echocardiography is used to form image of heart. Q.52 How is it that bats are able to fly at night without colliding with other objects? Sol. Bats are able to fly at night without colliding with other objects as they use reflection of ultrasound to know what object are around them. Q.53 Explain how, bats use ultrasound to catch the prey. Sol. Bats emit ultrasound. These are reflected by various obstacles and return to the bat’s ear. The nature of reflection tells the bat where the obstacles or prey is and accordingly the bat is able to catch its prey. 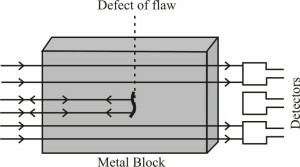 Q.54 Explain how, flaws (or defects) in a metal block can be detected by using ultrasound. Sol. Ultrasound is passed through the metal block which has to be tested. In case of flaws ultrasound does not pass through it but is reflected back. A detector on the other side of the block does not receive all the transmitted waves and hence the flow is detected . Q.55 Why are the ceilings of concert halls made curved ? Draw a labelled diagram to illustrate your answer. Sol. The walls and ceilings are made curved so that sound reaches all parts of the hall after reflection. 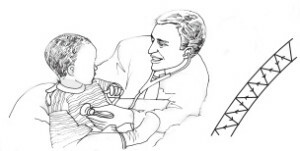 Q.56 Draw a labelled diagram to show the multiple reflections of sound in a part of the stethoscope tube. 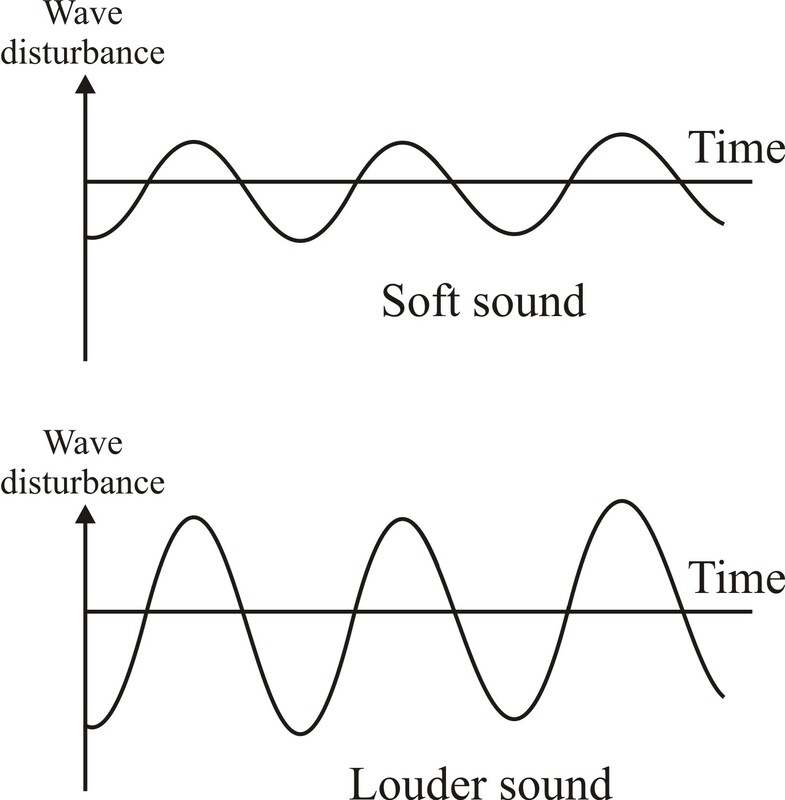 Q.58 (a) What is the difference between infrasonic waves and ultrasonic waves ? Q.59 (a) What is the frequency range of hearing in humans ? (b) Which of the following sound frequencies cannot be heard by a human ear ? Q.60 The echo of a sound is heard after 5 seconds. If the speed of sound in air be 342 m/s, calculate the distance of the reflecting surface. Q.61 The speed of sound in water is 1500 meters per second. How far away from an under-sea rock should a deep sea diver be so that he can hear his own echo ? Q.62 (a) What is meant by 'reflection of sound' ? What type of surfaces are the best for reflecting sound ? (b) Name any two objects which are good reflectors of sound. (c) State the laws of reflection of sound. (1) The incident wave, reflected wave and the normal all lie in the same plane. Q.63 (a) What is an echo ? How is echo formed ? (c) A man standing 825 meters away from a cliff (steep rock) fires a gun. After how long will he hear echo? Speed of sound in air is 330 m/s. Sol. (a) The repetition of sound due to reflection is called echo. It is formed if reflection of sound is heard after 0.1 s.
Q.64 (a) What is ultrasound ? What is the difference between ordinary sound and ultrasound ? (b) Write any three applications (or uses) of ultrasound. Sol. (a) Sound having frequency greater then 20,000 hz is called ultrasound. Ultrasound cannot be heard by human beings like ordinary sound. Q.65 (a) What are infrasonic waves ? Name two animals which produce infrasonic waves. (c) The audible range of frequencies of an average human ear is from 20 Hz to 20 kHz. Calculate corresponding wavelengths. (Speed of sound in air is 344ms−1 ). Sol. (a) Infrasonic are vibration of frequency less then 20 Hz. Whales and elephants produced infrasonic. (b) Sound waves of frequencies greater then 20,000 Hz are called ultrasonic waves. Porpoises and bats produce ultrasonic waves. (1) Echolocation (2) Echocardiography (3) Ultrasonography. (b) Name an animal which navigates and finds food by Echolocation. (c) Which of the two produces ultrasonic waves : porpoise or whale ? (2) Formation of image of the heart by reflection of ultrasound from heart is called echocardiography. (3) Creating images of different parts of the body by means of reflection of ultrasound is called Ultrasonography. Q.67 (a) What is sonar ? Explain its use. (b) A sonar station picks up a return signal after 3 seconds. How far away is the object ? (Speed of sound in water = 1440 m/s). Sol. (a) SONAR stand for Sound, Navigation And Ranging. It is a device used to measure distance, direction and speed of underwater objects. It has a transmitter and detector near its base. The transmitter transmits ultrasonic signals which get reflected by various underwater objects. These are received by the detector which can convert these waves into appropriate electrical signals and give us the required information. Q.68 Draw a neat and labelled diagram of the human ear. 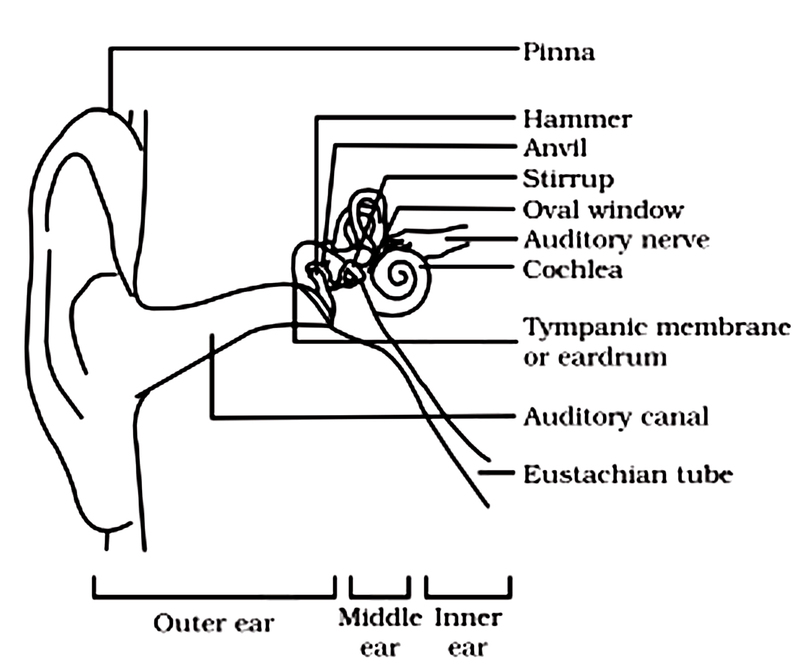 With the help of this diagram, explain the construction and working of the human' ear? Sol. The human ear consists of three parts – the outer ear, middle ear and inner ear. 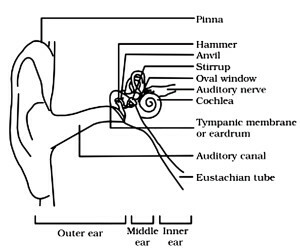 Outer ear : This is also called ‘pinna’. It collects the sound from the surrounding and directs it towards auditory canal. Middle ear : The sound reaches the end of the auditory canal where there is a thin membrane called eardrum or tympanic membrane. The sound waves set this membrane to vibrate. These vibrations are amplified by three small bones- hammer, anvil and stirrup. Inner ear : These vibration reach the cochlea in the inner ear and are converted into electrical signals which are sent to the brain by the auditory nerve, and the brain interprets them as sound. Q.71 Which kind of sound is produced in an earthquake before the main shock wave begins? Q.76 An echo-sounder in a trawler (fishing boat) receives an echo from a shoal of fish 0.4 s after it was sent. If the speed of sound in water is 1500 m/s, how deep is the shoal ? Q.79 The frequencies of four sound waves are given below. 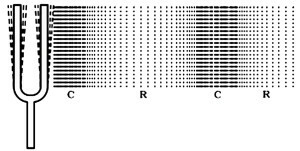 Which of these sound waves can be used to measure the depth of sea by the echo method ? Q.80 Which of the following frequency of sound can be generated by a vibrating simple pendulum as well as by the vibrating vocal cords of a rhinoceros? Q.81 Which of the following device does not work on the multiple reflections of sound waves ? Q.82 What type of waves are generated by SONAR device fixed to a fishing ship ? Q.85 The drawing shows a ship 800 in from a cliff. A gun is fired on the ship. After 5 seconds the people at the front of the ship hear the sound of the gun again. (a) What is the name of this effect ? (b) What happens to the sound at the cliff ? (c) How far does the sound travel in 5 seconds ? (d) Calculate the speed of sound ? (a) Which two waves represent sounds of the same loudness but different pitch? (b) Which two waves represent sounds of the same frequency but different loudness? (c) State whether all these sound waves have been produced by the same vibrating body or different vibrating bodies ? (d) Which vibrating body/bodies could have generated the sound waves shown here? (d) Tuning forks of different frequencies. Anhad adjusts the signal to the loudspeaker to give a sound of frequency 200 Hz. (a) What happens to the air in-between Anhad and the loudspeaker ? 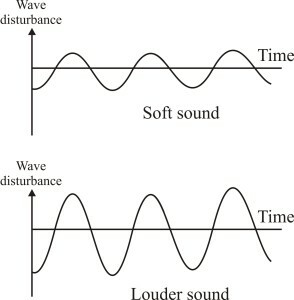 (b) Explain how Anhad receives sound in both ears. Sol. (a) The air starts vibrating at 200 Hz. (b) Anhad receives sound by his right ear through loudspeaker and by his left ear by the reflected sound. (a) On the graph paper given in Figure Y, draw a trace of the sound wave which has a higher frequency than that shown in Figure X. (b) On the graph paper shown in Figure Z, draw a trace of the sound wave which has a larger amplitude than that shown in Figure X.
Q.89 Three different vibrating objects produce three types of sounds X, Y and Z. Sounds X and Y cannot be heared by a man having normal range of hearing but sound Z can be heard easily. The sound X is used in hospital to break kidney stones of a patient into fine grains which then get:flushed out with Urine. The sound similar to that which is produced during an earthquake before the main shock wave is generated. (a) What type of sounds are (i) X (ii) Y, and (iii) Z ? (b) Name one device which can produce sound like X. (c) Name one device in a science laboratory which can produce sound like Y. (d) Name one device in our homes which can produce sound like Z. (e) What is the frequency range of sounds like Z? (a) a city (b) a village (c) a bare room (d) a furnished room? Sol. (a) In a city lot of sound from traffic would be heard. (b) In a village much less noise. (c) In a bare room if too much reverberation is produced.